A month ago while walking down the empty streets of Colchester City, I passed by one of the most beautiful buildings in the town, that of the Post Office – the building of hopes, love, sadness and dreams. It was already dark so I could see from the alighted windows the numerous shelves and the letters on them, all put in order. This view ,so simple but so fascinating, containing numerous people’s wishes, inspired me a lot, to an extent that I started thinking of my literature review on Charles Bukowski’s book “Love Is A Dog From Hell”. A month later, my inspiration of the building of the Post Office has gone, but I still has that of Bukowski’s poems and the description of a woman, “a six foot goddess” laughing with “the laughter of the mutilated who still need love’; description of a woman” who has saved” him “from everything that is not here”. She was just one more “creature dizzy with love”. My approach to Bukowski’s poems was of an adventurer. The book was a whole new trip for me; the trip of a loner, of a writer whose poems almost staggers the imagination. Love for this romantic man was when the love of his life has packed her bags and left him for eternity, love was shouting and yelling, and throwing to cause pain. 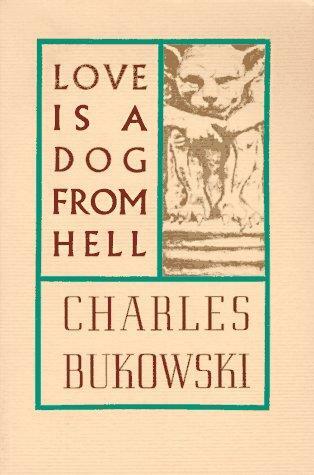 “Love Is A Dog From Hell” reveals the secret of man who experienced tough love better than any of us could. until you flushed me away. For Charles Bukowski love came in empty bourbon bottle form or a punch in the face and women who would leave his side and will never return. That was the poet’s reality, that was the “dog from hell” and every last one of us has taken that enigmatic road at least a few times in our lives. Charles Bukowski has been to hell and back in more ways than most of us, and he’s got the scars to prove it. crawling in and out of beds. nobody ever finds the one.